WATER, SOYBEAN OIL, MALTODEXTRIN, VINEGAR, BUTTERMILK POWDER, SUGAR, CORN SYRUP, MODIFIED CORN STARCH, SALT, GARLIC & ONION POWDER, POTASSIUM CHLORIDE, NATURAL COLOUR, PHOSPHORIC ACID, XANTHAN GUM, DRIED EGG YOLK, DISODIUM GUANYLATE, DISODIUM INOSINATE, SORBIC ACID, NATURAL FLAVOUR, SODIUM BENZOATE, LEMON JUICE CONCENTRATE, PROPYLENE GLYCOL ALGINATE, SPICE, DRIED MINCED PARSLEY, CALCIUM DISODIUM EDTA, SOY LECITHIN. Hellmann's® Light Ranch is made with real buttermilk, has no artificial flavors and is Gluten-Free. The Hellmann's® brand is recognized throughout the world for unrivaled quality and flavour and its commitment to real, simple ingredients, real buttermilk. 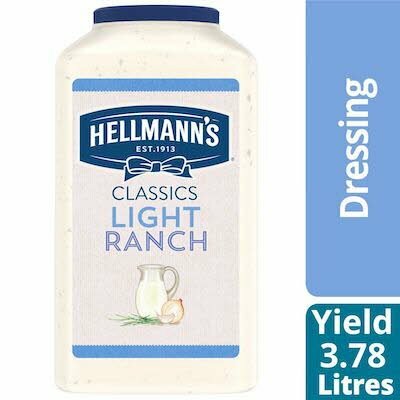 Hellmann's® Light Ranch dressing is great for green salads, bound salads, on vegetables, as a dip, sandwich sauce and more.